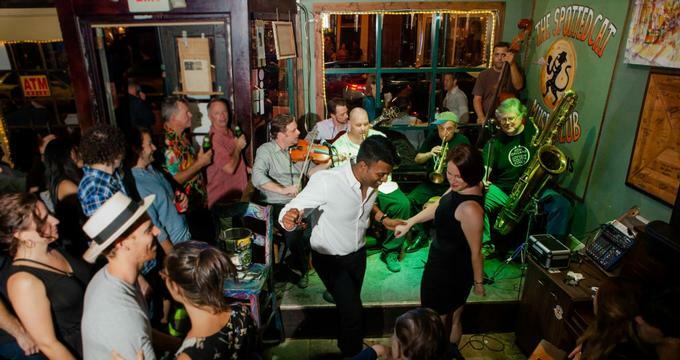 Dubbed as the quintessential Jazz Club in New Orleans, The Spotted Cat Music Club is a renowned international destination for lovers of jazz music. Locals know the place simply as “The Cat”, and it has been featured as such in all sorts of print media, commercials, and even movies as a place of outstanding jazz music and unique environment. In fact, it is hailed as #1 in most social media sites and is currently the cover of the New Orleans Tourist guide book. The Cat is a place that local, tourists, and celebrities visit in order to experience great jazz music and a wonderful evening in New Orleans. They have no cover charge, so guests prefer this spot over other places along Frenchmen St. if they’re looking for great live music. While the place is not a restaurant in itself, they do serve drinks at reasonable prices. With the minimum of a single drink order, guests can enjoy live music and exceptional dancers early in the afternoon until late in the evening. Some of the well-known regulars include the Washboard Chaz Blues Trio, Arsene DeLay, Cottonmouth Kings, and Antoine Diel. Guests must be at least 21 years old to enter. The Cat opens and starts its live music as early as 2:00 in the afternoon every day. Due to its popularity, there is no reservation system for The Cat. All guests need to remember is that they have to be: (1) at least 21 years old, and (2) ready to buy one drink. This is important since there is no cover charge. It is highly recommended that guests enter early, as the place becomes more crowded as the day goes on. In fact, there would be so many people it’s better to just stand up at some point or just claim a seat in the bar at the back. There’s a reasonable selection of drinks at the bar. There’s a lot of beer on tap, but considering that The Cat doesn’t charge cover, it might be more ideal to spend a bit more to get a martini or a cocktail. While The Cat doesn’t serve food, Frenchmen Street offers a potentially endless set of options for people. For starters, there’s Dat Dog and the Praline Connection, which is where people can order food from before they go into the venue. The Cat also sells a handful of interesting merchandise that serve as great souvenirs for tourists. There are shirts for both men and women, caps, koozies, portraits, and even shot glasses. For more information about the club and its services, contact 504-943-3887.